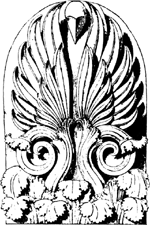 (stē`lē), slab of stone or terra-cotta, usually oblong, set up in a vertical position, for votive or memorial purposes. Upon the slabs were carved inscriptions accompanied by ornamental designs or reliefs of particular significance. Stelae were often used as commemorative stones in ancient Egypt and as boundary markers in Mesopotamia. The marble funerary stelae of Greece, especially of Athens, are among the most beautiful monuments of classical art. Likenesses of the dead were sculptured in relief and painted upon them. Stelae of great age are found in China and among the ruins of the Mayan culture in Mexico and Central America. An upright stone slab or pillar with a carved or inscribed surface, used as a monument or marker, or as a commemorative tablet in the face of a building. in botany, the central, or axial, part of the stem and root in higher plants. The stele consists of conducting and mechanical tissues and is surrounded by a primary cortex. an upright stone slab with an inscription or a relief. In the ancient world, particularly in Greece, steles served as gravestones. They were frequently used to mark boundaries or to commemorate an important event, for example, the issue of a new law. Today steles are often used not only for gravestones but also for monuments of all types and purposes. The part of a plant stem including all tissues and regions of plants from the cortex inward, including the pericycle, phloem, cambium, xylem, and pith. 1. In classical architecture and derivatives, an upright stone, usually a slab, marking a grave. 2. A wall area set aside as a memorial. French critics reading the volume of prose poems Steles (1912; 1914) in the wake of Henry Bouillier's magisterial dissertation in the 60s have tended to favor the latter approach; nevertheless, the dilemma has remained rhetorically constitutive of the field, demanding of every volume and essay that it first stake its position on the matter. The stele was discovered in 1990 broken into three pieces. The Zakynthians appear on the stele of the Aristoteles Decree as "the demos of (the) Zakynthians in/on the Nellos. 2] 96 itself reads quite plainly that these states' names are to be inscribed upon the common stele. Was Kerkyra a member of the Second Athenian League? The stele originally stood in the town of Sippar, some 30 miles upstream from Babylon, but an invading Elamite force plundered the city and carried away the stele as spoil. Mayers treatment of the Topzawa stele is downright irresponsible. Much can be definitively written into history, but the standing stele of Al-Rajajil remains an enigma. The Victory Stele of the Akkadian King Naramsin [twenty-third century BC] also commemorated a military campaign. Archeologists had earlier discovered a stele with an inscription that says the miniature stupa in the Dabaoen Temple contains a gold mini-coffin wrapped by a silver coffin cover. And another New Year launch is the HoloPresenter Stele touch-sensitive screen using the 40" HoloPro film. An enigmatic grave stele found in the Athenian Kerameikos in the 19th century commemorates the death of an Ashkelonite seafarer, SM[. The stela is nearly identical to the famous Stele of Naukratis, now in the Cairo Museum, which was discovered in 1899.